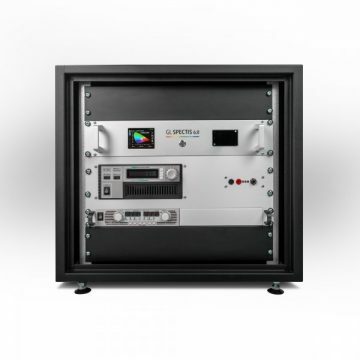 Quantify light and color from displays and other emitting surfaces. To be able to match the best optical probe to customer’s needs, it is important to know what the client has to measure, which quantities he needs to deliver, how wide a spectral range he has to measure in and which measuring point diameter he will be satisfied with. GL Optic offers variety of optical probes for radiometric measurements. They differ in spectral range, degree of cosine correction and a type of optic fiber..
Each complete set includes a measuring probe, a fiber optic cable, and adapter for a dedicated spectrometer. Includes calibration traceable to National Laboratories. 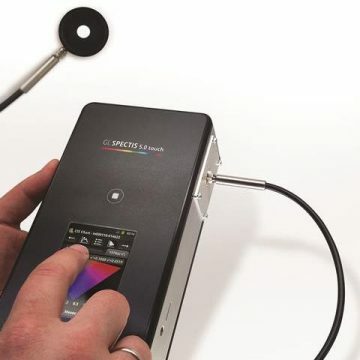 All GL Optic Spectrometers include smart system of detection that automatically detects a new probe and loads the appropriate calibration file. Constructed of high transmission quartz fiber optics, these optical probes can cover a broad spectral range from UV to NIR (200-1050nm). This accessory is intended for measuring luminance [cd/m2] of flat LCD and OLED panels and plasma FPDs. Typical devices to be tested are: television screens, computer monitors, avionics displays and other electronic displays and where there is a need to measure reflective surfaces – also walls and workplaces, projection screens and signs. This optic probe measures the light emitted in a particular direction by a given spot on the surface of a relatively large or extended source. The measuring probe can be installed on a tripod for distance measurements or directly on a screen with the use of a special stripe for contact measurements. The optic probe connects to GL Spectis 1.0 or GL Spectis 1.0 Touch. The probe comes with polymer fiber optic cable. Usable spectral range: 400-730 nm. This optic probe has a pen shape with just 1 mm measuring point diameter and comes with a flexible fiber optic cable. It is especially useful when it is necessary to measure small areas. The optic probe connects to GL Spectis 1.0 or GL Spectis 1.0 Touch. This accessory is intended for measuring luminance [cd/m2] of flat LCD and OLED panels and plasma FPDs. Typical devices to be tested are: signal indicators, avionics and other electronic displays. This optic probe measures the light emitted in a particular direction by a given spot on the surface. The probe comes with polymer fiber optic cable. Usable spectral range: 400-730 nm. 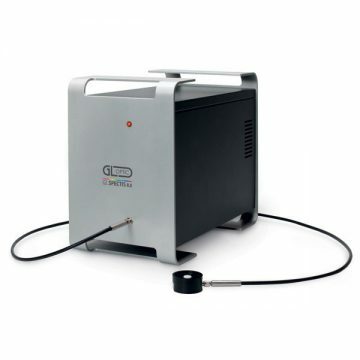 Luminance probe for point measurement of flat displays, LCD, LED, OLED panels, projection displays and indicating lights. The set includes a measuring probe, quartz fiber optics and an adapter with a coder for SPECTIS 1.0 series Spectrometer as well as a counterweight with a strap for hanging over the measured screen.